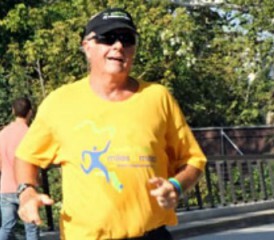 Four days before the 2012 Miles For Mesothelioma Road Race and Tribute Walk in February, Larry Davis was stuck in a South Florida Hospital room, sidetracked by another relapse from the cancer that was killing him. He was worried, but not about his physical deterioration, not about the pain growing throughout his body or the latest blood infection he was fighting, and not about the gall bladder gone bad. No, he was worried about running the annual race he helped organize three years ago to raise awareness and raise money and raise the spirit of all those fighting this horrible disease. One way or another, he said from his hospital room that day, he would be at the starting line Sunday morning with everyone else. And he was. Larry Davis never conceded a thing. Davis died this week, having left an indelible stamp on this battle against mesothelioma, the asbestos poisoning that causes it, and the troubling indifference he often saw around it. He was 66. He wasn’t famous like Steve McQueen, Merlin Olson, Warren Zevon or Hamilton Jordan, others who died of mesothelioma. But he became a down-to-earth example of the disease, showing others how to enjoy life while exploring ways to extend it. He chastised powerful companies that continued making asbestos products long after they knew the devastation it caused. He prodded politicians who allowed exposure to happen. He lambasted the pharmaceutical industry for often sticking its head in the sand. He even chided many of the mesothelioma doctors for their unwillingness to take risks and look outside traditional medicine to help patients. Davis, whose father died of mesothelioma after working in a paper mill for many years, lived six years after his original diagnosis of peritoneal mesothelioma. He lived longer than expected — the typical prognosis is 6-18 months — despite shunning the traditional chemotherapy/radiation treatments that were recommended. He relied, instead, on an immunotherapy and alternative treatment approach, believing his own immune system was his best defense. He was religious about his exercise, his diet, his daily routines. He turned to vitamins, minerals, foods like fermented wheat germ and mushrooms. A lifelong runner, he didn’t run and hide from the disease. Instead, he ran toward it, tackling it head on, asking questions, demanding answers, exploring every possible option. He spoke about mesothelioma to anyone who would listen. He became an unrelenting advocate for the thousands of mesothelioma patients. Each year, even as his health deteriorated, he traveled to Washington, D.C., to lobby his congressman for more research funding and for laws to ban all asbestos use. He circulated petitions, built a website, gave speeches on the topic. He was honored more than once for his work by a nation mesothelioma research foundation and the ADAO. In April, he was scheduled to speak at the ADAO’s annual conference in California, but he had grown too sick to travel so far from his South Florida home. His brother accepted the award in his place, providing a stirring talk in his honor. Davis was speaking then just a few weeks before his fifth major surgery and a few days before he traveled to North Carolina to join his daughter Courtney in a Father’s Day triathlon. It included a 14-mile bike, a 5-kilometer run and a 250-yard swim. He considered it therapy to take his mind off the pending surgery. The surgery did not go well. Davis will be honored again next week at a mesothelioma symposium in Washington, D.C. The symposium will include a trip for advocates to Capitol Hill. It’s a trip that Davis made annually after his original diagnosis, always hoping to make a difference. And he did. On her father’s website, Courtney Davis suggested donations in Larry’s memory go to an mesothelioma immunotherapy research grant. His friends in South Florida also set up a Larry Davis Scholarship fund for college-bound runners. The New Haven Register. (2012, July 8). Larry Davis Obituary.